Helping others find more peace, happiness, security and success in their lives is the bottom-line motivation that drives many people into the world of psychology. Upon this realization, most people ask themselves, what’s next? What is it you hope to accomplish most? What activities and daily practices will provide you with the sense of career satisfaction and accomplishment you’re looking for? These are questions that young psychologists ask themselves all the time. While it’s natural, in the early stages of career planning, to be unsure about what you want to do when you graduate, it pays to think ahead, and to research common careers available to those in psychology and other social science fields. One of the most rewarding of these is cognitive behavioral therapy. Learning to coach people through their fears, insecurities, failures, traumas and mental handicaps is challenging, to be sure, but it is also so rewarding – and cognitive behavioral therapy can absolutely help you do it. Before you understand how, though you need to know what this role entails. What Is a Cognitive Behavioral Therapist? Cognitive behavioral therapy, or CBT, is a specific type of therapy that focuses on getting short-term results to often long-term problems. People frequently cannot tell the difference between feelings and reality, especially in the aftermath of trauma or while they are experiencing a mental health disorder or addiction, so CBT helps them clarify the connections between thoughts, behaviors, relationships and past events. A cognitive behavioral therapist’s main role is to help people identify their thoughts and behaviors, specifically regarding their relationships, surroundings, and life, so that they can influence those thoughts and behaviors for the better. The goal is to get people to reflect on their unhealthy patterns and form healthier approaches to the challenges and emotions brought about by everyday life. Cognitive behavioral therapists don’t do just one thing to accomplish this, but rather use a variety of techniques. For example, their toolbox might contain techniques such as dialectical behavior therapy, rational emotive behavior therapy, cognitive therapy and more. While these may differ slightly in their approach, the main goal of a cognitive behavioral therapist is to help people see how their negative thought patterns are affecting their lives, and adjust them to in turn affect the real world, and their existence in it. The question of whether human perception accurately reflects reality has been plaguing philosophers for thousands of years. Increasingly, anecdotal evidence and studies have proven that we all bring a different set of experiences, beliefs, hopes and expectations to any given situation and, thusly, do not experience the world as it is, but as it is in our eyes alone. This understanding has given rise to the attendant insight that human thoughts and behaviors do not always reflect reality. Even when they do, people do not always act in the healthiest manner, or even in their own best interest. Aaron T. Beck, widely credited for developing this prong of psychological theory, believed that many of these patterns develop in childhood, and need to be addressed for the person to move on with a healthy life. The job of a cognitive behavioral therapist, therefore, is to challenge the beliefs that underpin the client’s experience of the world in order to change their behaviors. For instance, if a depressed client believes that nothing good ever happens, a cognitive behavioral therapist might walk them through the day they had yesterday. They might ask questions about what they ate, whom they saw, if they read books or watched television, what the weather was like … anything. In going through this list, the client is likely to see that at least one good thing happened, hence disproving their statement that life is all bad. While this might seem like a simple technique, such work is powerful. The human mind is ever suggestible, and while that’s often a bad thing, the power of persuasion can be used to show people their own agency, help them beat negative thinking, and give them tools for breaking out of negativity, anxiety, depression and other unhelpful patterns of thought. What Does a Cognitive Behavioral Therapist Do? Cognitive behavioral therapists work one-on-one with clients (though occasionally, they may work with couples or families) to explore beliefs and behaviors and determine how each is affecting a person’s life. Practitioners of CBT may work as therapists or counselors, psychologists or psychiatrists, or even social workers. Therapists typically walk patients through cognitive behavioral therapy on a short-term basis, usually no more than 20 sessions or so, with the goal of reaching a specific goal of healthier thinking and behavior. Afterwards, clients are assigned ongoing reading and homework to help them continue to make strides in their lives, cope with challenges and create a better reality than they had before. Cognitive behavioral therapists usually work in private practice, though they may also be employed by medical and educational institutions. Typically, they see patients in offices, where patients receive individualized attention in a safe and private space. While this process is not a quick fix, it has been shown to be widely effective in the treatment of many of the above disorders. CBT may be used in treatment of more than one of these mental health issues at once, though it may not always be as effective to combine many different goals into a single course of treatment. The most important determinant of success, however, is whether the patient is committed to the process. Since a variety of different careers may enable you to work with people on a CBT basis, there is no one salary or job outlook to consider. Rather, it’s helpful to know a range so that you can choose your career in accordance with both that and your other professional goals. Social workers, for example, can use CBT. They can expect to make about $46,000 per year or $23 per hour, and job positions are growing at a rate of roughly 12 percent, which is faster than average. Psychologists may also use CBT, and make about $75,000 per year or $36 per hour. They can expect to find work, as psychology jobs are growing at a whopping 19 percent rate. Lastly, psychiatrists make use of this technique as well, and make on average $200,000 annually and $96 hourly. Though no data is available for psychiatrist rate of job growth, we can assume that it, like all mental health roles, is growing rapidly. Those who practice CBT work with a constant flux of patients, usually for a length of time between 8 and 25 sessions, helping them focus on their thoughts (hence “cognitive”) as well as their emotions and behaviors. The goal is always to make headway against issues they are experiencing the present, rather than to focus on the past or future. Patients are expected to work on these issues outside of the office as well, so a big part of a CBT practitioner’s job is to assign helpful and productive work for their patients to complete. Therapists must also be able to recognize whether CBT will be helpful in an individual case. 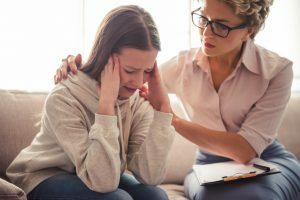 When clients don’t have a specific diagnosis, or have more generalized symptoms that don’t fall into a specific category of disorder, they may not get as much out of the process, and may be better candidates for traditional talk therapy. Because the range of job types practicing CBT is so broad, so are the educational requirements to use it. If you’re working as a social worker, you may only need a bachelor’s degree, though in some states or organizations, that might not be enough to officially say you practice CBT. Typically, a master’s degree is more appropriate if you are going to use any psychological approach. Psychologists may earn either a master’s or a doctoral degree, while psychiatrists need a medical degree because they can prescribe medication to their patients. If your degree is in another, but related, field, you may be able to practice CBT by earning a post-degree certificate, earning such titles as “Certified Cognitive-Behavioral Therapist” or “Certified Cognitive-Behavioral Group Facilitator.” Mental health counselors must also be licensed in the state where they want to practice. To get licensed, you usually need between 2,000 to 4,000 supervised clinical hours, working under a trained professional in the field. Whatever path you choose to take in the practice of cognitive behavioral therapy, your patients will thank you. Therapists who employ this technique have a proven track record of helping their clients break out of negative thought patterns, establishing new and better behaviors, and improving their lives overall. If you’d like to be a part of that, this is the career for you. Learn more about an online psychology degree.